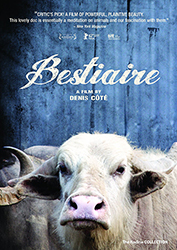 Fascinating and beguiling, BESTIAIRE is Denis Cote's mesmerizing meditation on the relationship between man and beast. This strikingly beautiful film about looking-starts with a group of art students attempting to sketch an animal-that blurs the line between observer and observed. There may be no traditional narrative, yet there is breathtaking dramatic tension in every exquisitely framed shot: the sight of a lion attacking the doors of its cage or the scurrying striped legs of zebras in a holding pen. Contemplative and enthralling, BESTIAIRE is cinema at its purest. A woman who has just been released from prison moves into a house in the Canadian forest and receives a visit from her lover.